This collection presents best practices and lessons learned from leading healthcare organizations, helping to apply proprietary research findings on HCAHPS and patient experience to your own organization. In a time of growing transparency and a more critical patient-consumer, healthcare scorecards present both a challenge and an opportunity to utilize the results for effective messaging and clinical improvement. 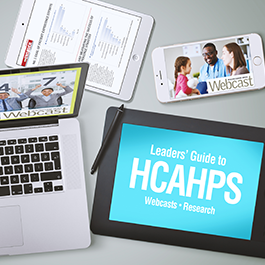 The Leaders' Guide to HCAHPS presents best practices and lessons learned from leading healthcare organizations, helping to apply proprietary research findings on HCAHPS and patient experience to your own organization. HCAHPS gets the attention of healthcare leaders because it is a reporting requirement for most organizations, the results are public, and the scores influence reimbursement dollars. This new collection of articles and resources reveals how healthcare providers are using HCAHPS scores to engage patients and staff and protect revenue, and how you can apply our proprietary research findings on HCAHPS and patient experience to your own organization. What specific steps did California–based St. John’s Hospital take to create a patient-centered culture, thereby increasing scores and improving value-based purchasing metrics? How is North Carolina–based Vidant Health incentivizing its staff to focus on improving HCAHPS scores? What impact could HCAHPS scores be having on readmission penalties, and vice versa? How do the scores at safety net hospitals fare against their non-safety counterparts? What key lessons did Twin Rivers Regional Medical Center glean from their initial patient engagement initiatives, and how did they overcome those downfalls to bolster scores? How did Cleveland Clinic improve patient experience through peer-driven physician-patient communication skills training? How did Wheeling Hospital’s ED achieve a dramatic turnaround in patient satisfaction scores through electronic patient tracking, alerts, post-ED outreach, and performance incentives? This report, Patient Experience: Cultural Transformation to Move Beyond HCAHPS, reveals how a growing number of patient experience programs have moved beyond focusing primarily on training nurses to also include physicians and a host of nonclinical staff. Another sign of the degree to which organizations are embracing patient experience is the increasing number which feature a chief patient experience officer (or individual with similar responsibilities) on the senior leadership team. Discover how Cleveland Clinic’s REDE training program has increased CGCAHPS outcomes, resulting in doctor communication scores rising from the 18th to the 83rd percentile. Learn about the importance of aligning organizational culture with a patient-centered care approach. Find out how Carolinas Healthcare is targeting patient experience performance in specific service areas by using a process improvement effort based on Lean fundamentals. Gain insight into the infrastructure areas that healthcare organizations are focusing on for patient experience improvements over the next three years. Find out how Sharp Healthcare’s Experience program is complemented by Planetree designation efforts. Learn the top three areas where healthcare organizations say having a positive patient experience is most important. In a time of growing transparency and a more critical patient-consumer, healthcare scorecards present both a challenge and an opportunity to utilize the results for effective messaging and clinical improvement. Whether an organization is crafting scorecards for self-evaluation or responding to public reports, the data must be handled strategically. Norton Healthcare developed a scorecard that has become a blueprint for other organizations because of its unique focus on organizational values and its ability to be customized for clinical and quality teams. Through strategic analysis and creative application of CG-CAHPS data across their six clinics, Lakewood Health System has been able to raise the bar on service excellence, ranking among Minnesota’s top performing clinics for patient experience. By increasing score transparency among staff and patients and launching innovative programs to engage patients in care improvement, Lakewood was able to create a sustainable and physician-driven model of exceptional patient experience.